Wherever you are in the design and renovation process, I encourage you to develop a holistic approach to thinking about technology, furniture, and spatial design. Globally, only about 20 percent of the $9.52 billion is being invested in K–20, according to GeekWire. Why isn’t the K–12 market driving more of this spending? One of the latest buzzwords in education is “active learning,” but what does this really look like in the classroom? Here are some great tools to introduce active learning into your classrooms. Digital equity is one of the most complex and urgent issues facing 21st-century educators. 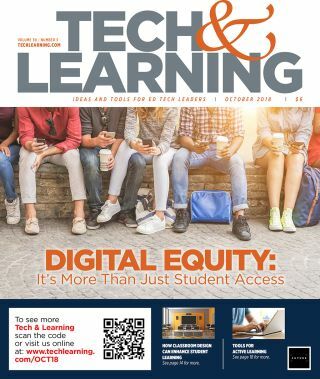 Many educators are looking beneath the surface inequities of devices and connectivity to consider how digital tools can revolutionize learning and address even deeper inequities. School leaders discuss their district approaches to Social Emotional Learning. We ask our advisors about their current data privacy and security challenges.